A native North Carolinian, Matt was born in Chapel Hill. He spent his early years in Raleigh, Currituck, and Durham before moving to his hometown of Shelby, North Carolina. He attended Wake Forest University, earning a degree in economics before graduating from the Norman Adrian Wiggins School of Law at Campbell University. From his studies and work in both the private and public sectors, Matt gained unique insight into business and employment relationships as they are influenced by competition, technology, demographics, finance, and policy. In his workers’ compensation defense practice, Matt draws on his education and experience to analyze and forecast risk while preparing his clients to preempt and mitigate their exposure and protect their interests. Matt began his legal career with a summer internship with the Shelby City Attorney. He worked as an appellate clerk under Judge Donald Smith and then Judge (later Justice) Bob Edmunds. 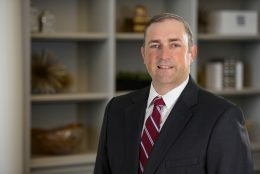 For nearly two decades, he has practiced exclusively in the field of workers compensation defense representing private and governmental entities, employers, and insurers before the North Carolina Industrial Commission and our appellate courts. He has litigated and negotiated the resolution of claims involving accidental injuries, occupational diseases, asbestosis and silicosis, death benefits, non-insured employers, and both employee and co-defendant fraud. Matt values his relationships with clients, peers, and the professionals he encounters, and he considers it a privilege to collaborate with them on workers’ compensation concerns.